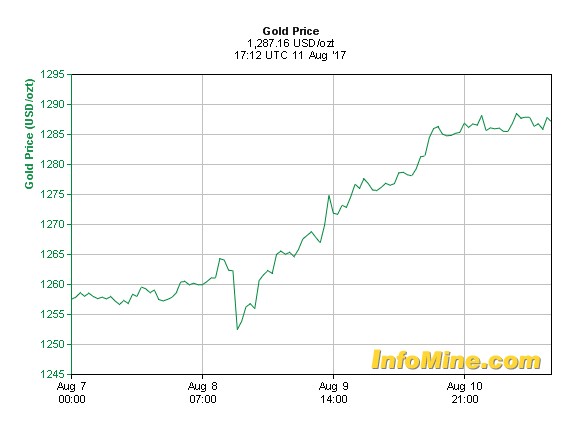 Gold got a boost from Trump and his tweets this week with the yellow metal up 2.25% over the last five days to $1,287/oz. 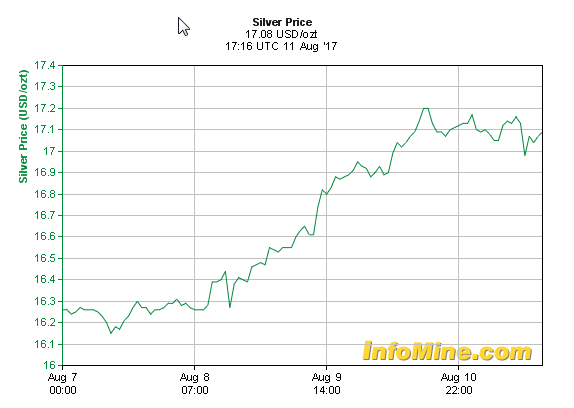 Silver is up over the same period to $17.08/oz. President Trump has been escalating the rhetoric against North Korea tweeting today that "military solutions are now fully in place, locked and loaded". North Korea is presumed to be seeking nuclear bomb miniaturization along with more sophisticated missiles that can carry nuclear payloads. Earlier this month, gold had been facing headwinds with investors turning bearish on the metal. Retuers reported that SPDR Gold Trust, the world's largest physically-backed gold fund, saw its holdings drop more than 7 percent in July. The roaring equity markets and worries about a Fed hike to stem possible inflation were all weighing on gold.